Specifications Available in Standard as well as customized sizes. Optimum space utilization. - Heavy Duty Rack construction up to optimized height. - High quality and corrosion resistance powder coating. - Modular, Durable & Economic Concept with High Stock Rotation Frequency. 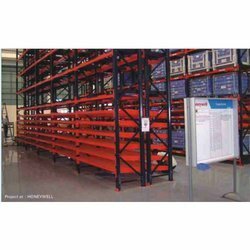 We have gained a remarkable position in the industry by offering a qualitative assortment of Selective Pallet Racks that are generally used for storage and order of goods, bins, cartons. The offered racks are manufactured employing high-end technology and well-tested raw material in adherence to industry defined guidelines. Appropriate selection of materials with focus on extending the life of reusable materials, using rapidly renewable materials and materials with recycled content. 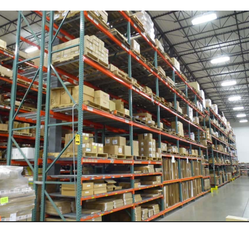 Offered Selective Pallet Rack comprise heavy duty pallet rack finish and offer cost effective storage solutions. We are offering Pallet Racks to our clients. We are engaged in offering Raw Material Selection services that are carried with the help of an economic model that helps in deciding technology to be used. Once the raw materials have been selected, it is easier to decide the right processing technology for the same. Our services are well appreciated for their reliability, flexibility, and accurate selection of raw materials. We are offering Selective Pallet Rack to our clients.